The WordPress Loop is the PHP code which used to display main content and excerpts of content on WordPress sites. Inside the loop there are some functions that are run by default to display posts. And the great advantage of the wordpress loop is the same PHP tags to display any content inside wordpress sites. Theme developers can format this loop output by using template tags to customize how each post inside the loop is displayed. Today I am going to php function to display most recent post and most viewed post in our index theme. Adding this to our single.php, and make sure you paste in inside the loop. To display the number of views a post has, just adding this in our index template where we want the post view count to be displayed. 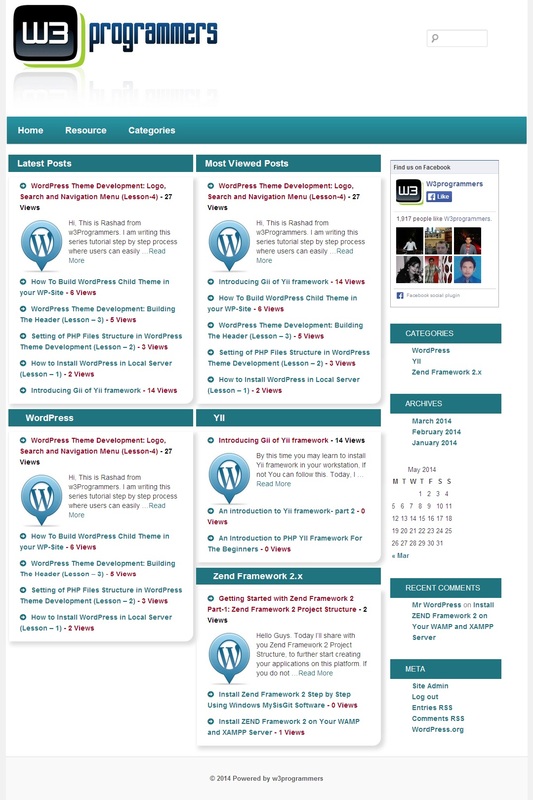 And I have got the following preview of our index blog in w3Pro wordpress theme. In the next tutorial I will work on single post php to display the full content.